From the bold taste of the Kiolbassa smoked sausage to the tangy fire-kissed tomatoes and rich sauce with just a touch of cream, this dish will be your new weeknight go-to. It’s a delicious, complete meal and there’s only one pan to wash when it’s done! Recipe courtesy of Southern Bite. Melt the butter in a large skillet over medium heat. Add the sliced sausage and the onion and cook, stirring occasionally, until the onions are tender - about 5 minutes. Add the garlic and cook for 1 minute. Stir in the chicken broth, undrained tomatoes, and the pasta. 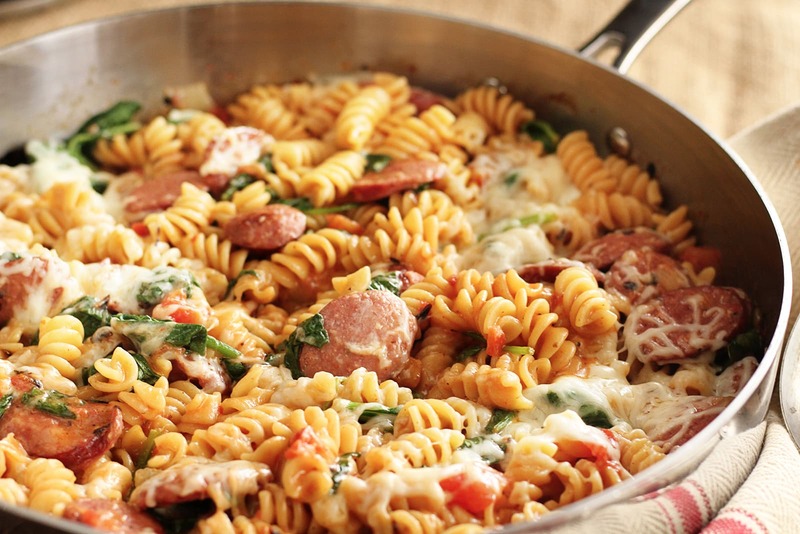 Cover, reduce the heat to a simmer, and cook, stirring occasionally, until the pasta is tender - 10 to 15 minutes. In a small bowl, whisk the cornstarch into the cream and pour the mixture into the skillet. Stir well and allow to thicken. Add salt to taste. Stir in the spinach (use as much or as little as you'd like) and allow it to wilt. Sprinkle with the cheese and cover to allow it to melt. Serve immediately.